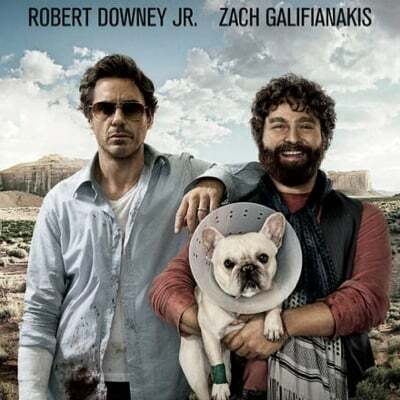 Yes, this fall's Due Date looks a whole lot like a remake of Planes, Trains and Automobiles with Robert Downey Jr. and Zach Galifianakis instead of Steve Martin and John Candy, but dammit, I'm excited about it anyway. Director Todd Phillips is on a roll following the success of The Hangover, and the first trailer was hilarious, showing off the individual senses of humor of the people involved more than some generic Hollywood sense of what a road movie should be. Anyway, a new poster for the film isn't nearly as exciting as a trailer, but it's what we've got today. If you've seen the trailer it'll all look familiar-- desert background, actors looking disheveled, Galifanakis wearing silly clothes and holding a dog (an upgrade from Baby Carlos of The Hangover I guess). But tell me that's not an image that will get you to stop in a movie theater, stare for a few minutes, and decide it's necessary to see this movie. Because I know that's what you're thinking. Check out the poster below, or in full-size at Yahoo! Movies. Due Date hits theaters November 5.